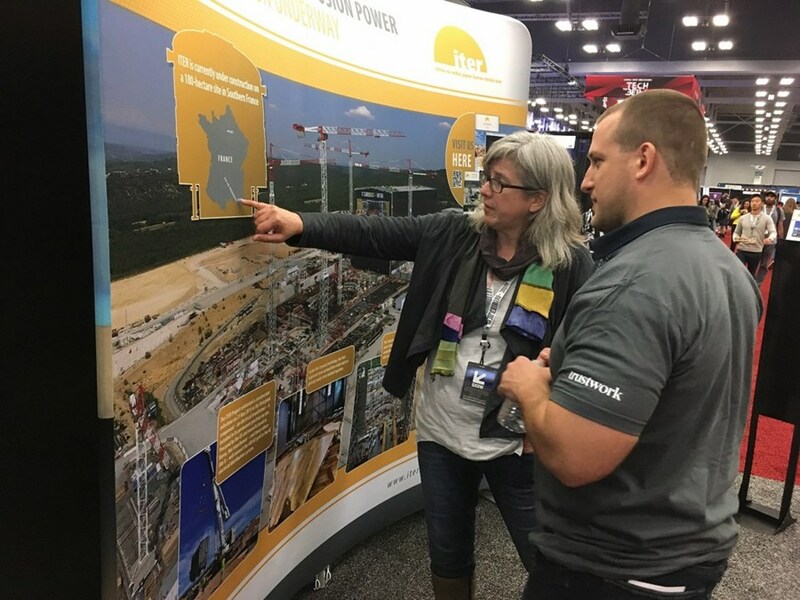 Everything passengers always wanted to know about ITER was provided during Lufthansa's special flight to the South by Southwest festival in Austin, Texas. On 8 March, a specially equipped airbus A380 left Frankfurt for Houston, Texas—the entry port for those attending the South by Southwest Festival from 9 to 18 March in the city of Austin. On board, a little studio had been set up in the rear of the plane where five speakers from very different fields presented their projects, backed up by live performing artists. Adding even more uniqueness, this particular FlyingLab occurred on International Women's Day—so the speakers were women, and flight LH440 was commanded by an all-female crew. The presentations, follow-up interviews and Q&A sessions were made accessible to all 509 passengers on board through video circuit. LH440 was just about to pass the southern tip of Greenland, at a cruising altitude of 34,000 feet, when it was ITER's turn to talk about the Sun—and how we are trying to harness the energy that powers it. 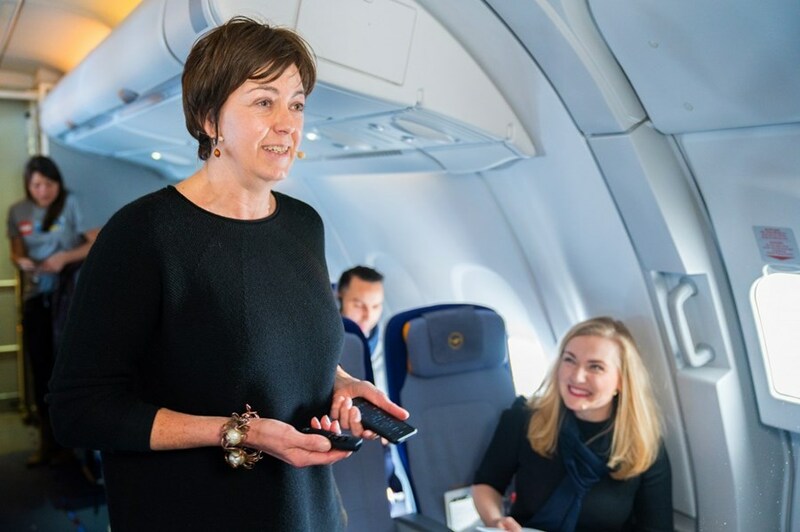 ITER Communication's Sabina Griffith made the in-flight presentation on ITER as part of a Lufthansa FlyingLab en route between Frankfurt and Houston. This unusual start to the week was fully in sync with the creative, exploratory and future-driven spirit of the festival that aims to "explore what's next in the worlds of film, culture, music and technology" and that celebrates the "unexpected discoveries that happen when diverse topics and people come together." On one side of the ITER stand at South by Southwest, the North American company Vice Media offered "free stuff and baby goats." (Practicing yoga side-by-side with goats is apparently the latest therapeutic trend in a technology-dominated world.) On the other, Japanese exhibitors promoted "sushi teleportation"—or the ability to 3D print real food based on digitalization. Across the corridor, the German sound pioneer Sennheiser presented a real singer supported by a virtual guitar and saxophone, made visible on large pads through augmented reality. The South By Southwest Festival (SXSW) is frequently referenced as the world's biggest and craziest event for the music, film, gamer and interactive industries—and for all pilgrims of the bitcoin and blockchain age. Held every March in Austin, Texas, since 1987, the festival now attracts upwards of 300,000 people. There is music for every taste, and the long queues in front of the theatres indicate that Steven Spielberg, Mark Hamill, Ethan Hawke and other prominent names of the film industry are in town. The ''international effort to build a Sun on Earth'' held its own among the high-tech stands of South by Southwest. 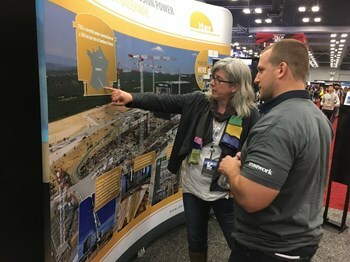 Pictured is Lynne Degitz from US ITER. And why is ITER present? At last year's SXSW gathering, the documentary Let there be light premiered and was rapidly rated amongst the 15 "must see" films of the festival. That triggered intense interest in fusion on the part of the festival organizers and attendees, leading to a flurry of communication with the ITER Organization and ultimately the decision to attend the show and hold up the fusion energy flag. So although the ITER stand had nothing truly "geeky" to offer, the international effort to build a Sun on Earth for the purpose of advancing fusion energy—innovation on a massive scale—enthralled and inspired. From the many engineers at SXSW who were familiar with fusion from their university days, there was genuine excitement at seeing the project rise out of the ground. Electricity is the key to this flashy and funky world of artificial intelligence, virtual reality and immersive 3D experiences. Without a massive supply of clean energy there will be no AI robots, holographic musicians, self-driving intelligent vehicles or ... sushi teleporters.